I want all my work to reflect the density of our experience, so every character is part of us at one time or another. The asylum is where we drop our guard - where we are placed sometimes reluctantly, sometimes with relief, where normality is a mask and we can accept a form that belies 'normal' proportions and relations. However, embracing normality is as absurd as embracing absurdity - and what seems to be teeming with life can be allusive and point to our ultimate dilemma - our aloneness. My reality is an infinitely meaningful absence of meaning. I retreat from all points of view except this. Hence I can only paint what I mean by refusing to mean what I paint. Pratt Institute 1949 - 1958, graduated with a B.F.A. U.S. Air Force 1951 - 1955. Art Director, Doyle Dane Bernbach, N.Y. 1958-1971. Creative Director, Doyle Dane Bernbach, London. 1964-1966. Studied with James Brooks and Jack Tworkov at Pratt Institute in the 1950's, and worked with the sculptor Reuben Nakian in the 1960's. Moved to Penobscot, Maine in 1971. Works shown in the Farnsworth Museum, the Portland Museum of Art and numerous other galleries. 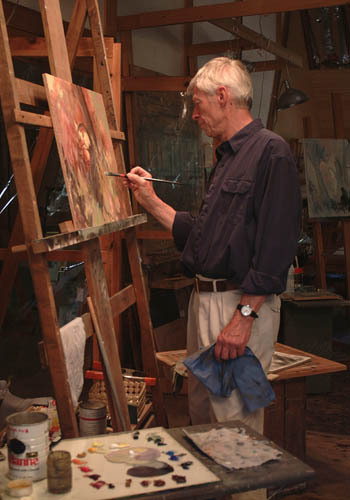 Opened Larson Fine Art in 1984, showing Larson work exclusively. Renamed gallery 'Larson Studio and Gallery' in 2002. 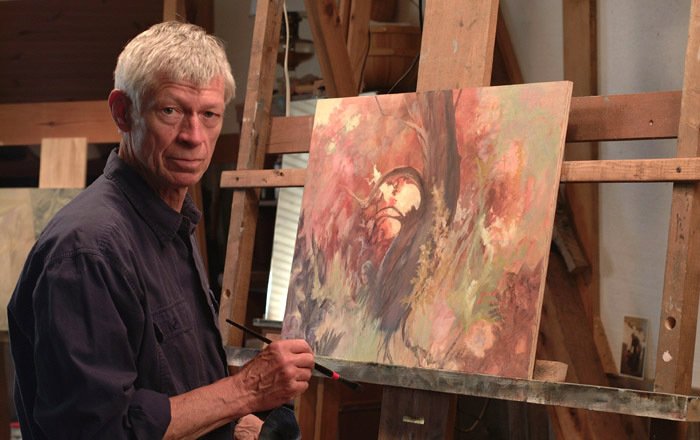 Appointed a "Maine Master" posthumously in 2011 by the Union of Maine Visual Artists.